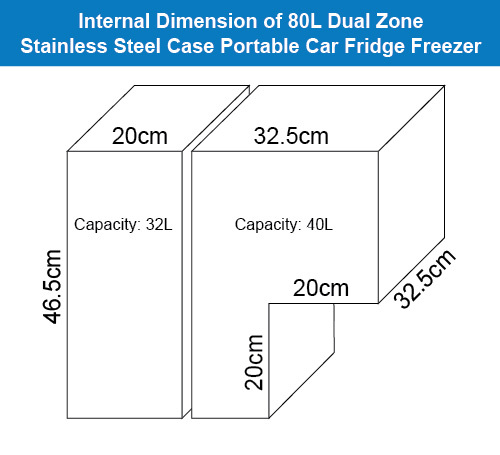 Stainless Steel 4WD Fridge/ Freezer 80L Dual Zone with 6 Year Warranty!! The new Techniice Stainless Steel Fridge Freezers are powered by the legendary German Danfoss Compressors and come with a 6 year parts and labour warranty backed by one of the largest national service networks. 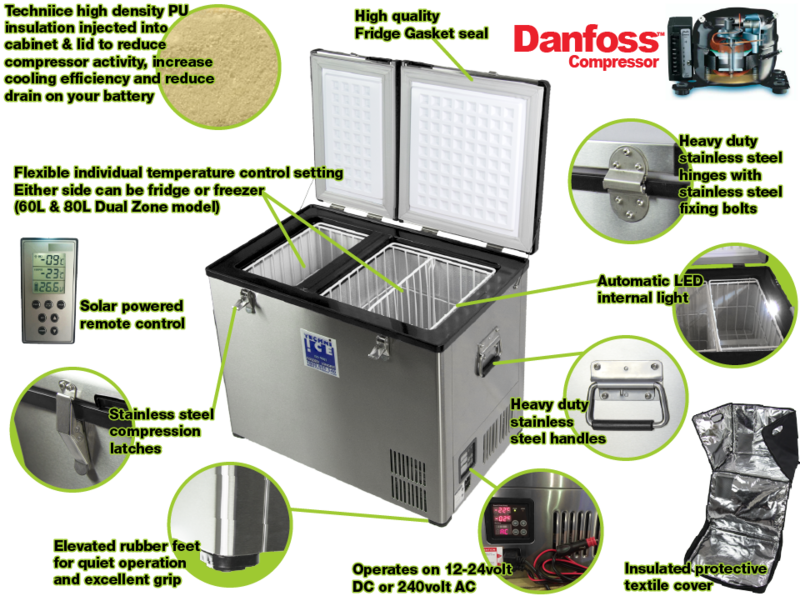 - Thick Insulation - Thick Techniice Specification multi compound PU to the cabinet and lid which greatly reduces compressor activity and minimizes battery drain. - Techniice is a Trusted Australian Owned and Operated Company, operating 31 years. In sync with our iceboxes, we are using polyurethane to insulate your fridge / freezer to get the maximum performance out of the Danfoss compressors, extending battery life and keeping your product cooler for longer. With our in built 12v / 24v and 240v connections, you can use your fridge / freezer when connected to mains or when mobile in most vehicles including trucks, 4x4’s and boats making it a very versatile option for keeping your product cold. Both connections can be plugged in simultaneously and can interchange depending on the available source. The Techniice Powder Coated Portable Car Fridge/ Freezers have been designed to range between 10 degrees C and -22 degree C which is adjustable on your display panel settings. We also give our customers the option to set your battery protection level at 10.0, 10.7 or 11.8 volts DC to prevent draining the battery source. This level is adjustable on the display panel and it ensures that there is sufficient battery power to re-start vehicles etc and not leave you stranded. Our Powder Coated Portable Car Fridge/ Freezers have been designed with your well-being in mind. As part of this, we have installed a safety alarm that is set off if the fridge / freezer lid is left open. This simple audio indication will highlight that the lid is still open to prevent the spoiling of your product. For our customers, we have endeavoured to make a fridge / freezer available that is almost unheard during its operation. The efficiency and design of our Danfoss compressors will have your fridge / freezer running at optimum performance while offering customer comforts that Techniice is renowned for.